What's the plural of walrus? Walrus. 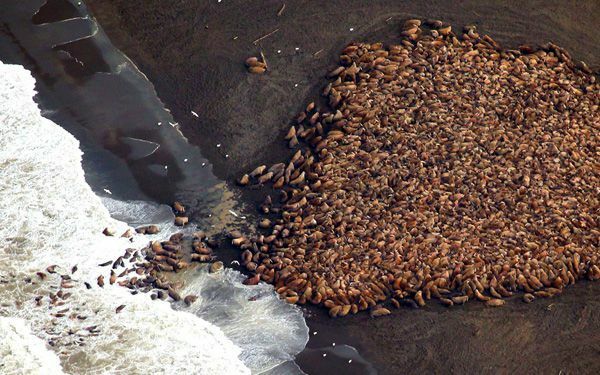 Pacific walrus that can't find sea ice for resting in Arctic waters are coming ashore in record numbers on a beach in northwest Alaska. Andrea Medeiros, spokeswoman for the U.S. 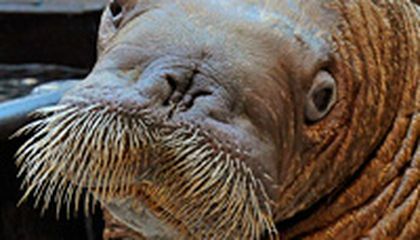 Fish and Wildlife Service, said walrus were first spotted Sept. 13 and have been moving on and off shore. Observers last week saw about 50 carcasses on the beach from animals that may have been killed in a stampede, and the agency was assembling a team to determine their cause of death. "It's another remarkable sign of the dramatic environmental conditions changing as the result of sea ice loss," said Margaret Williams, managing director of the group's Arctic program. "The walruses are telling us what the polar bears have told us and what many indigenous people have told us in the high Arctic. And that is that the Arctic environment is changing extremely rapidly and it is time for the rest of the world to take notice and also to take action to address the root causes of climate change." Critical thinking challenge: Why are scientists seeing this phenomenon now, instead of a couple months ago? This is a phenomenon because the scientists needed time to find out why they were here. I think that the walruses are cool but they should not be running for their lives from warm water. What an interesting development. The answer as to whether the climate is changing is an obvious "Yes", but i wonder if it is truly the result of human interference. The signs that the walrus are gathering like this leads me to believe that something outside of nature's grip is happening to the world around us. it's cool how all of these walrus came together one this beach i think it's sad how the ice is melting and all of that because they don't have anywhere to live. wow! i have never sean so many walruses at a time! thats so cool to me because when i was little i saved a walrus it was on the shore. I went to alaska to see my great aunt and i saved a abanded walrus. It was a very cool/intertaning day. Have you ever seen at least more then 100 walrus? well try going to Alaska you would be expected to see more than 35,000 walrus up to the most. A wall of walrus would be an akward but also exciting view to see. WOW! 35,000 walrus in Alaska its insane how much that is, and I'm glad they haven't gone extinct because walruses are cool, and amazing creatures of the sea. I like this article because it gives us a bit of information about sea lions in comparison to walruses. Scientists probably didn't see this coming now because, they were too busy on the climate issues. It was also probably hard for them to determine the pattern the walrus were going through because, they were coming in and out of Alaska. This is so sad. This make me realize that we should do something about global warming. Animals should not be punished for humans choices. Thy are losing there places to rest and give birth. I think we need to find a way to make things greener. The main idea of this article is that the walruses are moving ashore in large numbers on a beach in northwest Alaska. About 35,000 walruses were photographed five miles north from Point Lay. I think that this story is important and could lead to showing people a change in the Artic area. It could lead to more scientist doing research and prevent anything bad from happening. I think they didnt notice it until now is because its becoming more of a problem. A problem for the envirorment, other animals. But since the cliamte is changing and its to warm where are all the walrus and polar bears, etc. where are they going to go if there 'homes' are not there?